I am currently knee-deep in my busiest season of the year. Since mid-December I have been on the road every week to numerous states doing seminars, attending trade shows and doing consulting visits to client’s properties. This puts me in contact with hundreds of deer hunters every week and some weeks it is thousands. The great people I get to meet is actually my favorite part of my “job”. Within these numerous and frequent conversations with other deer hunters there are a few questions that I get asked over and over again. One of the most frequent topics involves “buck-beds”, which leads to questions like – What do you think about buck-beds? Do buck-beds really work? Do you make buck-beds? I finally decided that I needed to come up with a good response to these questions in order to get those asking the questions to really think about my answer to their question and challenge their thought process. Q: What do you think about buck-beds? A: I prefer buck motels. Q: Do buck-beds really work? A: Not as well as buck motels. Q: Do you build buck-beds? A: No, I build buck-motels and then let the bucks pick their beds. When it comes to whitetail habitat improvement projects, a lot of land managers have bought into the buck-bed craze. They have spent countless hours building buck-beds on their properties and wonder why they don’t have a wall full of big bucks to show for their efforts. This often leads to them asking me my opinion about buck-beds. I have no idea who came up with the idea of buck-beds but let me state for the record that I have no doubt that a specially created buck-bed can certainly work to entice a deer to bed in a specific spot. While I don’t doubt that they can work to some degree, some folks have made big claims about how they can get a buck to bed in a certain spot day after day. I have always wanted to ask, “If buck-beds work so well, why don’t the buck-bed proponents have a wall-full of fully mature bucks to show for their efforts?” I mean if a person can get a buck to bed in the same spot every day, why not leave him alone for a few years and then shoot him when he gets fully mature? Again, I am not saying that buck-beds never work. What I am saying is that they aren’t all they are cracked up to be and a serious whitetail land manager would be well advised to spend his time and energy in ways other than building buck-beds. Successfully turning your property into one that consistently churns out mature bucks is a lot like killing mature bucks; a good dose of common sense is way more important than gimmicks and gadgets. Deer hunters who consistently tag giant mature bucks utilize sound hunting practices to get the job done. Land managers who have turned their properties into big-buck factories utilize sound habitat enhancement practices and a well-designed layout of their property. In both cases, there are no short-cuts. By the time the late season rolls around every mature buck spends the majority of his daylight hours in his motel, often only coming out in extremely cold brutal winter weather conditions to feed. So what is a buck motel? A buck motel is a large secure bedding area measured in acres, not in the number of beds. In fact a buck motel has so many bedding options that a buck can utilize multiple beds based on factors such as wind direction. I assure you that I can get a mature buck to spend more days in a year bedding in one of my motels than anyone on the planet can get a buck to bed in one specific bed. Think about it, it just defies common-sense that a buck is going to bed in the same spot day after day. If it were that simple every deer hunter in North America would have a wall full of mature bucks. All we would have to do is create a buck-bed then go sit over it on opening day each season. I tell my clients that one key to consistently killing mature bucks is to hunt them on the same property where they spend their daylight hours, where they bed. I do my best on every property I consult on to design a custom plan that makes it is as likely as possible that a mature buck will spend as many days during the year as possible bedding there. I once called these areas “sanctuaries” but that term didn’t seem to cause people to stop and think like “buck-motel” does. So what does it take to make a buck-motel? It takes as many acres as possible of extremely thick cover that is 100% free of human intrusion. Yep, it really is that simple. You can make it harder if you want but you are only fooling yourself, not the bucks you hope to kill. Make it big, make it thick, and stay out! Location of the buck motel on a property is also very important but with every property being unique it is impossible for me to adequately cover that topic in this blog. Think of it this way; bucks have done a fine job picking their own beds for thousands of years; they don’t need our help doing it now. 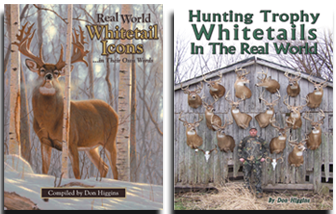 My 2 books on hunting trophy whitetails can be ordered on this website!